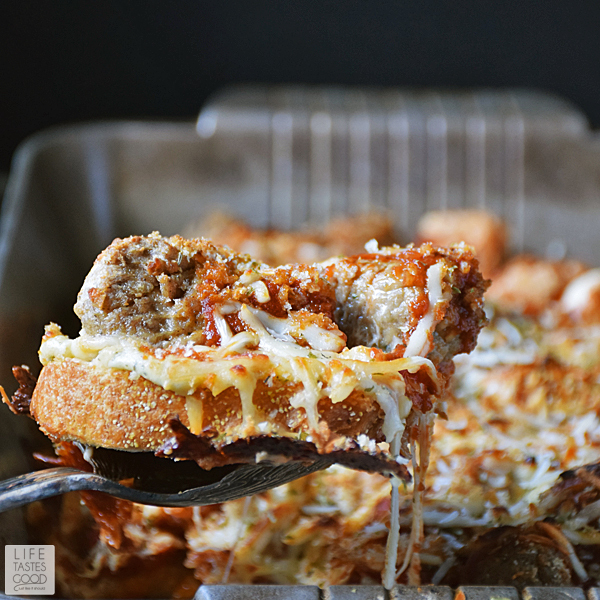 Easy to make, saucy, and cheesy, this Meatball Sub Casserole is a family favorite dinner that's on the table in just 30 minutes! 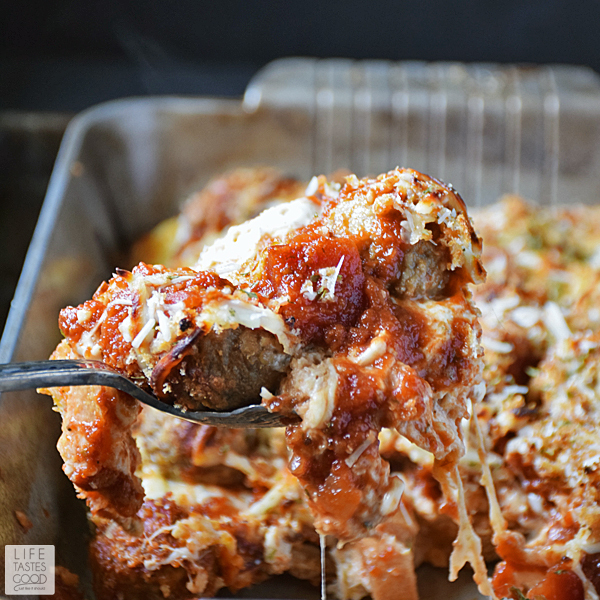 I make this recipe whenever I have leftover meatballs and red sauce, however, you can also make this with frozen meatballs and jarred sauce. It's up to you! Either way it is easy peasy! To make this casserole, preheat oven to 400 degrees F. and coat a casserole dish with cooking spray. I used a 13x9" pan. Slice baguette into 1" slices and place into bottom of casserole dish to see how many you need to cover the bottom of the dish. Then coat each slice with the garlic and herb cheese spread and place back into the baking dish to cover the bottom. 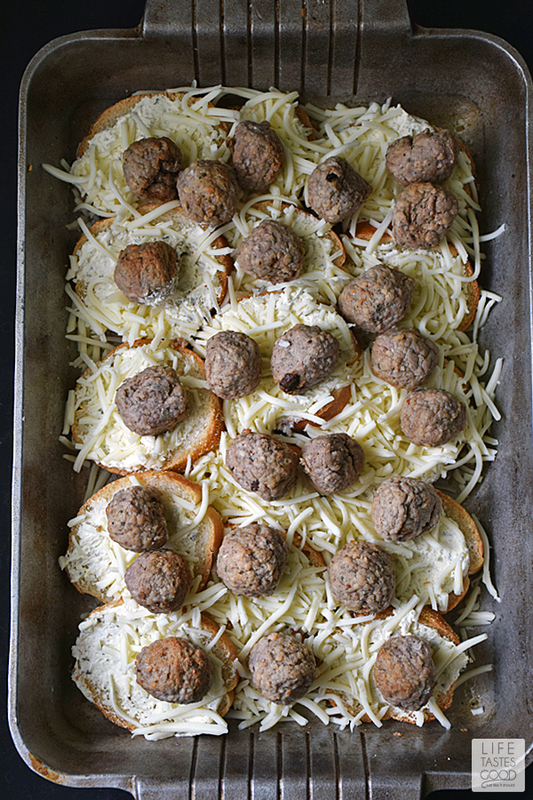 Top baguette pieces with 1 cup shredded mozzarella cheese and 18-24 meatballs. 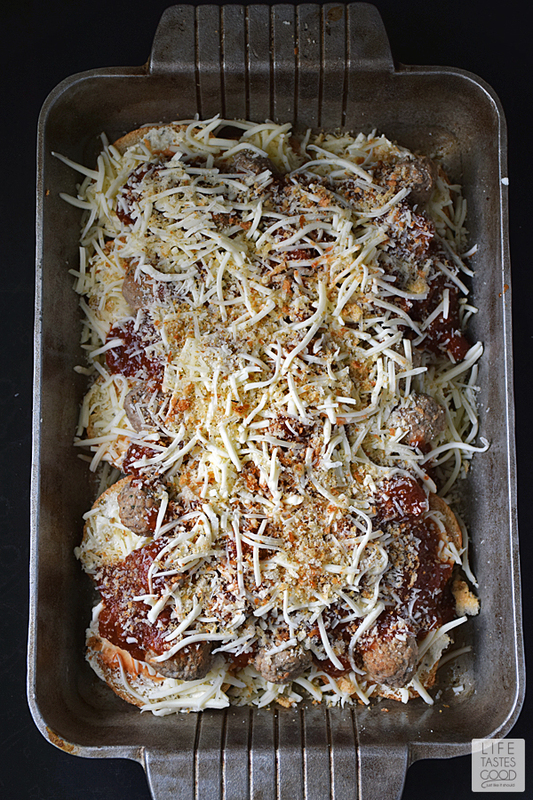 Cover the meatballs evenly with 3 cups Red Sauce or 3 cups of your favorite jarred sauce and top with remaining cup of shredded mozzarella cheese. Sprinkle on a tablespoon of Italian bread crumbs and 2 tablespoons shredded Parmesan cheese. Bake in the preheated oven for 20 minutes or until the cheese is melted. If you are like me and prefer your cheese slightly browned, turn on the broiler until the cheese is browned to your liking. Watch it closely! It will burn quickly if you are not careful! Preheat oven to 400 degrees F. and coat a casserole dish with cooking spray. I used a 13x9" pan. Slice baguette into 1" slices and place into bottom of casserole dish to see how much you need to cover the bottom of the dish. 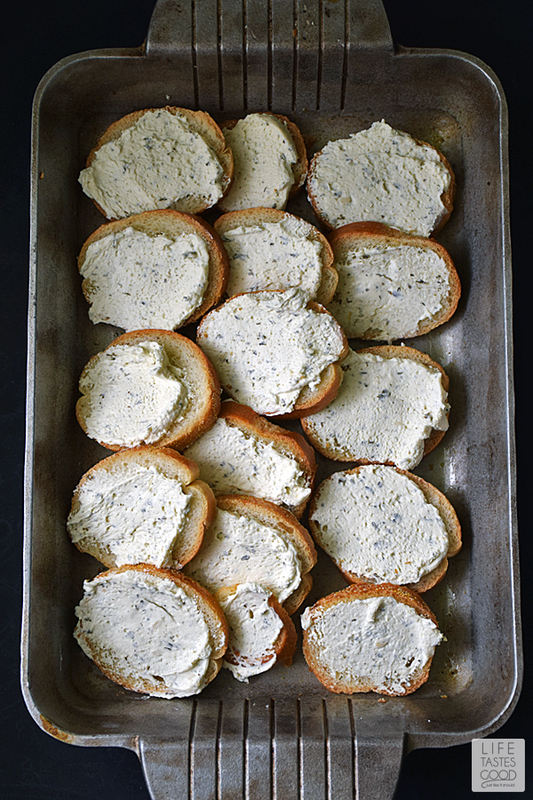 Then coat each slice with the garlic and herb cheese spread and place back into the baking dish to cover the bottom. Sounds awesome, my husband would love this! Yes ma'am! I am right there with you on that. This is the meatball recipe I use: http://www.ourlifetastesgood.blogspot.com/2012/03/meatballs.html This recipe makes approximately 40 (2") meatballs. 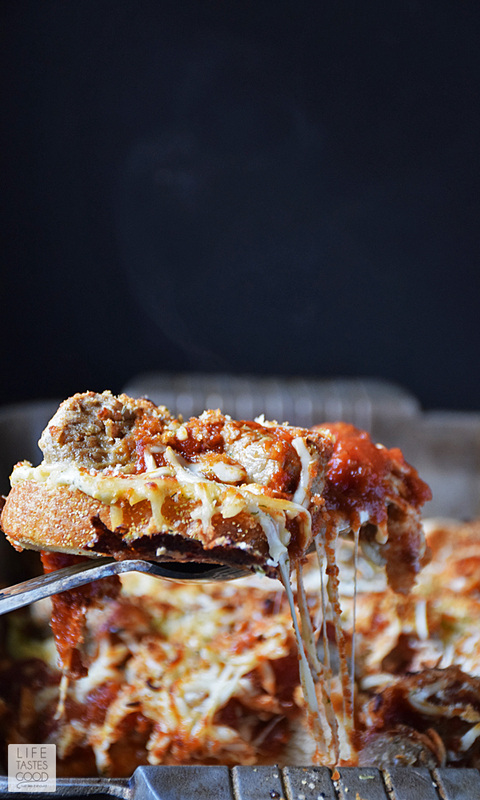 Typically I'll make that up with my red sauce for spaghetti & meatballs and then use the leftover meatballs & sauce to make this Meatball Sub Casserole. If you just want to make up the meatballs for this casserole, a little over a pound will be enough. 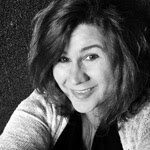 I hope that helps and thanks for the great question, Melissa! It was good but, my bread turned out a soggy mess. And idea how to make it without the bread getting soggy? This recipe was posted on my FB wall today. It looks yummy, but I have to ask...is that a Magnalite pan you are using? This pan is from Wilton Armetale from their Grillware line. It's interesting you ask about Magnalite though. I had a set and really loved it, but since changing to an induction stove top, the anodized aluminum didn't work for me. I never did have a casserole type pan with my Magnalite set though.